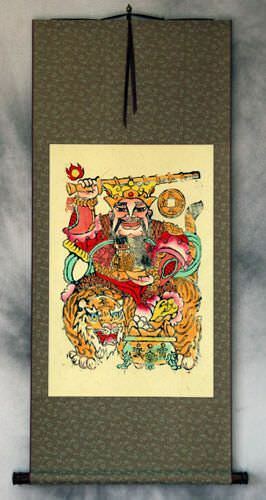 Artwork Panel: 27.8cm x 39.3cm ≈ 11" x 15½"
Silk/Brocade: 36.8cm x 101.7cm ≈ 14½" x 40"
This depicts Guan Yu (also known as Guan Gong) the warrior saint of ancient Asia. In Japan, his name is romanized as Kan'u. Though his origins are in ancient China, he is known in multiple Asian cultures as the greatest warrior or general of the ages. Shines to him can still be found in China, Japan, Korea, and Vietnam. 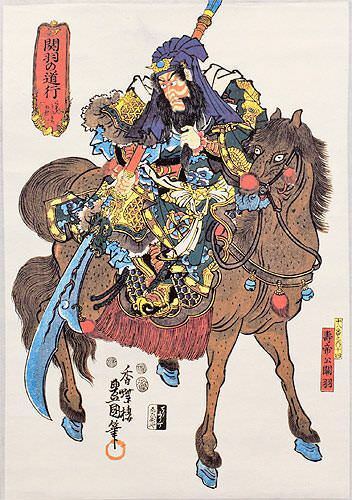 Thus it's not so unusual that a Japanese artist would create artwork depicting a great Chinese warrior. 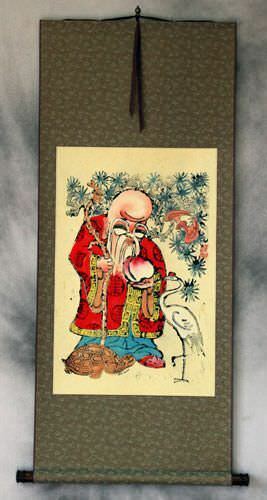 This is a fine art giclee reproduction of a very old Japanese woodblock print. This was made months ago, rather than centuries ago. Printed on handmade paper with lots of fibers and husks (just like ancient paper). Original woodblock was created in Japan, around 1852.